John and I took a joint trip to Brooklyn over the long holiday weekend. Many of our closest friends, including John’s brother, have moved there over the past year and are sorely missed. It seems like one of us always has a trip there in the works, so it was great to go down together and get everyone under the same (bar) roof. The weather was gorgeous and we had a terrific time. I wanted to use the visit as an opportunity to bake something for our fantastic and accommodating hosts, Matt and Melissa, but I was rushing (as usual) so it had to be quick and easily portable. 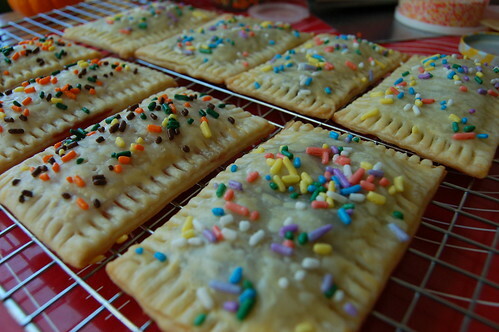 I decided on shortcut homemade Pop-Tarts…and by shortcut I mean made with store-bought refrigerated pie dough. I know this is a sin (I KNOW) but in the interest of full disclosure I’m going to always tell the truth here…the good, the bad, and the shortcut. Plus, I like to think making something halfway is better than making nothing at all. I was actually really surprised to learn that Kellog’s introduced Pop-Tarts in 1964, which is much earlier than I thought. They stole the idea from Post, who had introduced their own version 6 months earlier, but Kellog’s did a better job naming their product (the Post version was called “Country Squares”) and promoting it. This included a talking toaster mascot named Milton. Milton didn’t last past the 70’s, but Pop-Tarts have not followed suit. For something so dry and artificially flavored, Pop-Tarts are wildly popular. They are Kellog’s best-selling product, meaning they out-sell all the cereals and other brands under the Kellog’s name, such as Keebler, Cheez-It, and Morningstar Farms. For my semi-homemade version I unrolled the refrigerated dough and got out some strawberry and blueberry preserves, colored sprinkles, egg wash, and a pizza cutter. After that these things pretty much make themselves. I stuck with fruit fillings but you could also use something like Nutella or chocolate chips mixed with a little peanut butter. I also skipped making an actual glaze. I just used an egg wash and sprinkles. 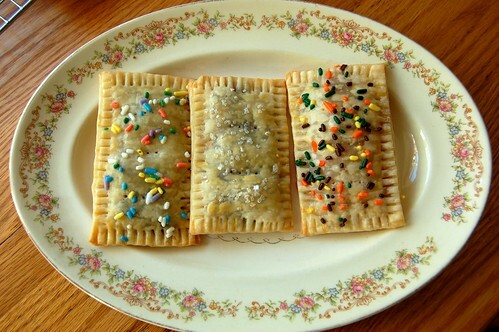 The glaze would have made them look more like “real” Pop-Tarts, but I wouldn’t have had time to let it dry. Roll out the dough and cut into an even number of equally sized rectangles. I used a pizza cutter and it worked perfectly. 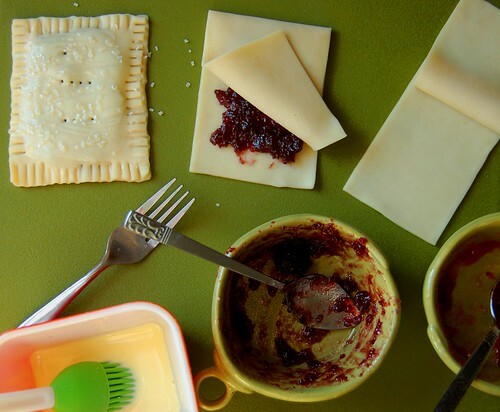 Spoon the preserves into a thin, even layer onto half of the dough rectangles. Leave a 1 inch border around the edge. Whisk the egg and milk together, and use a pastry brush to coat the edge around the preserves. Place remaining dough rectangles on top of the preserves and press lightly to seal. Dip the tines of a fork into the egg mixture and press around the edges of the pastry. Brush the tops with the remaining egg mixture and lightly coat with sprinkles. Bake for 12-15 minutes, until lightly golden. Before the weekend was up, Kayte and Melissa made sure we got in a visit to Four and Twenty Blackbirds (previously mentioned here). Stay tuned for this visit’s pie selection! They look delicious. I think it’s completely fine to use store-bought dough every now and then. 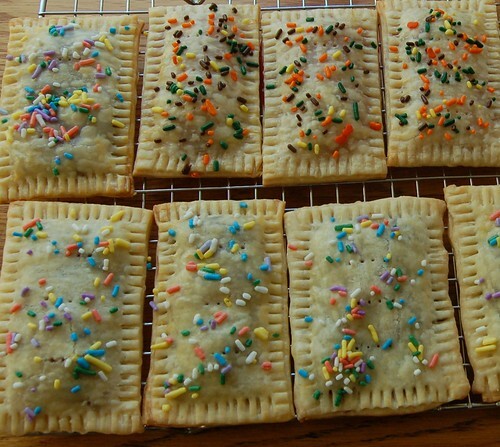 It’s not like you bought actual Pop Tarts — you still did a lot of from-scratch work on these. Glad you had a good time in Brooklyn. Hope to hear more about your visit. You are always so thoughtful with your baking. Your photography looks as professional as your pastry. 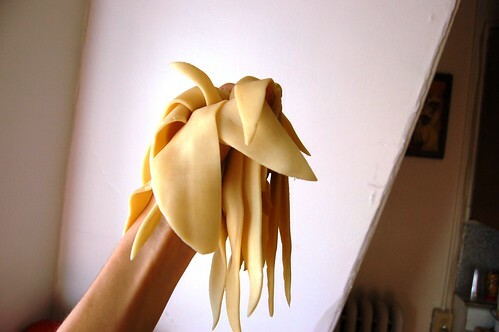 we are making these SOON! maybe holiday pop tarts. oh yum. I was in Target last night and saw a “Limited Edition” pumpkin flavor. I am sure it tastes disgusting, but a homemade version sounds promising! Maybe a sister baking project! It was in my head the WHOLE TIME! Haha!